Despite the large uncertainties associated with economic conditions, local policy makers have to assess future policy options against a solid foundation of shared and objective understanding. However, there is a lack of robust and timely statistical information at a local level. In order to draw a meaningful picture of current local economic performance, it is therefore necessary to consider sub-regional information in light of more up-to-date regional and national data. An example of the type of analysis that is used to inform future policy is the Spatial Review of the South West Economy, carried out by the Economy Module of the South West Observatory. This review provides sound descriptive knowledge about the structures and trends that have shaped the economic characteristics in the region at various levels; and assesses recession impacts and resilience across the South West. The report is broken up into different themes – businesses, households and labour market. Sub-national official and other statistics have been collated for each theme, drawing on a number of sources. The statistics are analysed spatially and over time, visualised (charts and maps), and then interpretations of emerging patterns in those trends provided in the context of underlying spatial differences. For example, when comparing rural and urban business populations, the report finds that, when agriculture is excluded, the distribution of sectors in urban and rural areas is largely similar. There are differences, however, between the sector composition of different parts of the region (see figure). The chart shows that there is variation both between distinct urban areas (towards the left hand side of the chart) and between largely rural areas (county areas are shown to the right). 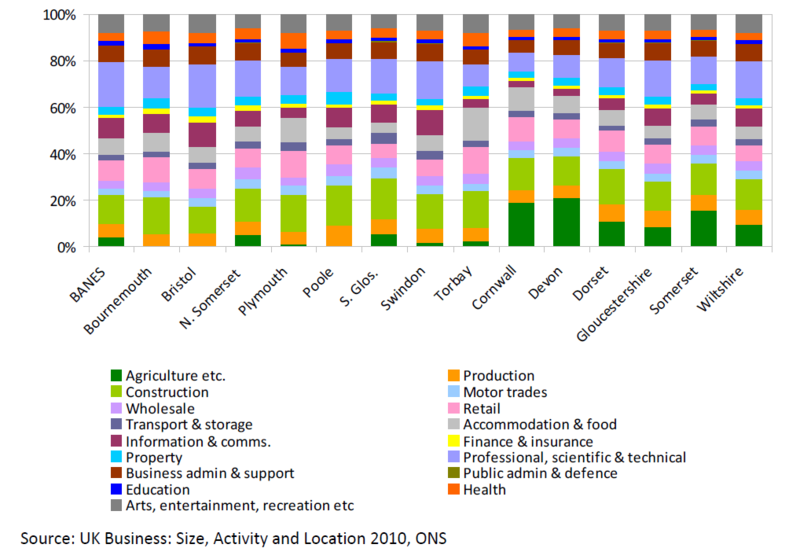 For example, Cornwall and Devon have higher shares of agriculture than the other counties, while the more accessible counties of Gloucestershire and Wiltshire have larger shares of professional, scientific and technical businesses. Indeed, there are also differences in this sector across the urban areas, with Bristol, Bath and North East Somerset (BANES) and Swindon having greater shares than elsewhere. This suggests better links into the “knowledge economy” in the north of the region, which in turn contribute to these areas’ relatively high productivity. Figure 1: The sector composition of the different regions within the South West. Overall, this analysis (reported in the Spatial Review: Sub-regional analysis of the SW economy) highlights the differences in resilience across the South West of England in terms of businesses, labour market and households – stressing the extremes within the region rather than the average and retaining a regional perspective in order to set the context for discussing its constituent parts. These types of reviews provide a strong benchmark for considering the spatial aspects of local economies, and serve as a tool used by those interested in the future development of that part of England to follow future trends, shape aspirations and pursue productive investment and competitiveness.